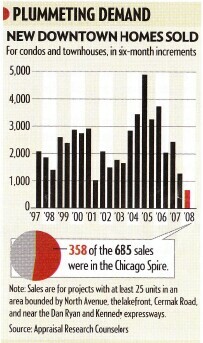 And of these 685 units more than half were from the Chicago Spire. Given that construction cranes continue to fill the skyline and existing units continue to be foreclosed it’s a mystery how they are going to ever sell all these new units. One would think that a) this is good news for affordability and b) this will eventually depress prices in the areas of the city that have thus far been immune from the price declines – e.g. Lakeview and Lincoln Park.